Who Knew There Were So Many Video Tributes to I Want My Hat Back? Wait... I'm in a movie? Really? Whenever I review a book, I normally check on two things before I post the review – I do a quick search to see if the book or author has an official website, and I do a quick search to see if there’s any video that relates to the book in question. I’m especially interested in the video because I think publishers and authors have been creating some very cool and engaging video content lately, ranging from book trailers, author Q&A sessions, read-aloud videos (which I’ve had problems with in the past), fan-made tributes, etc. Also, since I’m the world’s worst over-writer, I think the video is a nice break from my normal, cringe-inducingly large blocks of uninterrupted text. So, after finishing my review of Jon Klassen’s I Want My Hat Back, I went looking for any accompanying video for the book online and found a strange little mix of the expected and definitely unexpected. First, I found Candlewick Press‘ official book trailer for I Want My Hat Back, which is nicely produced, it’s very cute – it is an above-average book trailer. Then I discovered a full-length animated version of I Want My Hat Back. At first, I’ll admit, this video confused the heck out of me. The video – apparently the work of an Italian animator – seemed maybe professional enough to be “official,” but, despite its obvious production value, there were a few red flags that outted it as a fan effort. See for yourself. It’s slick, right? But it’s also kind of strange. The fonts are off, there’s that insertion of odd red question marks and other characters to accompany the bear’s questions, and the moment where the bear realizes that he’d already seen his hat is melodramatic and trippy in all the wrong ways. Then there’s the music. The soundtrack – widely praised on the video’s YouTube comments – is a really weird, over-dramatic piano/electronic piece that completely swallows any of the fun and whimsy of the book. It is SO moody and SO serious as it builds to a crescendo that it literally made me uncomfortable. The animation itself is pretty impressive – it looks like something Weston Woods could’ve produced – but the filmmakers made a lot of bad directorial choices and really didn’t capture the tone of the book at all. THEN – yes, there’s more – I discovered that, apparently, I Want My Hat Back videos have become a kind of weird internet meme, which, I guess, is good because it speaks to the popularity of the book, but… yeah. Some of these are odd. First up is a fairly popular one (based on YouTube views) in which a famous anime character named Akemi Homura – from the Japanese TV series Puella Magi Madoka Magica – takes on the role of the bear as she goes looking for her hat. Quick warning – I don’t get 99% of the jokes in this video. And it just goes on and on from there. There another video tribute to I Want My Hat Back featuring Professor Hershel Layton from the popular NintendoDS game series, there are more parodies, there are read-aloud videos… it’s kind of crazy. Normally, I’m lucky just to find a book trailer online, but I definitely wasn’t expecting to find SO many video tributes, parodies, and homages to an award-winning kids’ book on YouTube. 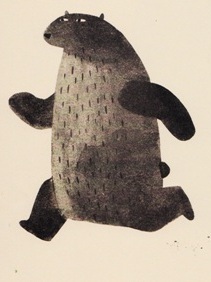 I guess Jon Klassen created something iconic enough with the storytelling and structure of I Want My Hat Back that people across communities – from the animation geeks to the video game geeks to the anime geeks and beyond – have embraced it as their own, which, when I think about it, is a pretty wonderful compliment to the original book. UPDATE: Just after posting this, a friend sent me a link to the awesome website Know Your Meme where they did a much, much more complete cataloguing of the I Want My Hat Back meme/video tributes than I ever could. Very, very cool site.